In the gritty underbelly of 1920s Sydney, a fresh-faced country girl is about to arrive in the big, dark city – and risk everything in the pursuit of her dreams. Sydney is no place for the fainthearted – five shillings for a twist of snow, a woman for not much more, and a bullet if you look sideways at the wrong person. Dolly Bowman is ready and willing to take on all the brash, bustling city has to offer. After all it is the 1920s, a time for a girl to become a woman and fulfil her dreams. Turning her back on her childhood, she takes up a position working as a housemaid while she searches for her future. World War I flying ace Jack Dalton knows he’s luckier than most. He’s survived the war with barely a scratch, a couple of astute business decisions have paid off, and he’s set for the high life. But a glimpse of a girl that he had forgotten, from a place he’s tried to escape suddenly sets all his plans awry. Try as he might he can’t shake the past, and money isn’t enough to pay the debts he’s incurred. I'm not much of a romance reader, but I rolled the dice on Téa Cooper's Jazz Baby. The WWI reference caught my attention and I was more than a little intrigued by the setting. Unfortunately, the novel didn't work for me and I admit, I'd be hard pressed to recommend it. For one, I felt the jacket description incredibly misleading. The blurb paints Dolly Bowman as an adventurous and determined young woman, but her character is neither. Exceedingly naive and prone to making brash assumptions, Dolly is much more of a Dumb Dora. Her romantic interest, Jack Dalton, had potential, but he's far too pure of heart for a Lounge Lizard. I was similarly turned off by Cooper's highly coincidental plot twists. I wont ruin the story for anyone, but Jack and Number Fifty-Four, the man he meets at Susie's, Cynthia's sudden change of heart, all of it left me rolling my eyes. There is no tension here and very little mystery, just a drawn out chain of events leading to one inevitable conclusion and forgive me, but that's not the kind of literature that appeals to me. It was a crap shoot going in and this time fortune failed me. I wanted something historically authentic, characters who radiated the attitudes and conscience of the jazz age, but I afraid Jazz Baby missed the mark and left me wanting. He cast his eye up and down her trim figure. She'd undone the dreadful brown worsted coat and the sight of the heart-shaped neckline on her plain cotton dress made a man wonder what lay beneath. Jack quelled the desire to laugh at his reaction, sitting here watching his erstwhile sister, thinking thoughts he didn't even dare admit. Trapped and cloistered in her own home. Anne de Bourgh, wealthy heiress daughter of the inimitable Lady Catherine de Bourgh, yearns to be set free from her luxurious prison, Rosings Park. Her life stretches out before her, ordered and planned, but it is a life she does not want. She wants more. She wants to be free. She wants to do everything that has been forbidden her, and she wants more than anything to fall in love with whom she chooses. Lady Catherine de Bourgh has other plans for Anne. Will Lady Catherine have her own way as always? Will Anne succeed? Can she break through the barriers of wealth, rank and duty? I think most book junkies can understand the impulse that led me to Karen Aminadra's Rosings. I finished book one, looked the author up, realized she'd written a sequel and quickly succumbed to the enthusiasm that lingers after completing a title you've enjoyed. That's right folks, I am an addict. I'm not at all interested in rehabilitation so don't ask, but I'm always accepting recommendations if you have something you think I should consider. For the record, I liked this piece. Anne is practically a footnote in Pride and Prejudice and I really enjoyed seeing her step into the spotlight. As with Charlotte, I think the premise set forth in the jacket description compliments Austen's classic and I appreciate how Aminadra sought to build on details established in the original text. I'll grant she takes liberties with the material, but all things considered I have only one complaint: Lady Catherine de Bourgh. Anne's mother terrorizes Lizzie for flashing her 'fine eyes' in Darcy's direction and she isn't any kinder to the residents of Hunsford in Charlotte, so why Aminadra attempted an about-face in Rosings is beyond my comprehension. I adore the layers Aminadra gifted Miss de Bourgh, but the effort she put toward reforming her ladyship seemed entirely unnatural considering the earlier incarnations of the character. Anne realised , with a sinking feeling in the pit of her stomach, that if she did not assert herself now and on this particular issue, she would quite possibly never be happy again. When Charlotte Lucas married Mr Collins, she did not love him but had at least secured her future. However, what price must she pay for that future? She once said she was not romantic, but how true is that now after almost one year of marriage? Mr Collins is submissive in the extreme to his patroness, and his constant simpering, fawning and deference to the overbearing and manipulative Lady Catherine de Bourgh is sure to try the patience of a saint, or at least of Charlotte. As Charlotte becomes part of Hunsford society, she discovers she is not the only one who has been forced to submit to the controlling and often hurtful hand of Lady Catherine. She feels trapped and realises her need for love and affection. She is not as content as she once thought she would be. The easiest thing to do would be to maintain the peace and do as she is told. But as Charlotte witnesses the misery around her due to her inimitable neighbour, she must decide to remain as she is or to begin a chain of events that will change not only her life but also the lives of those around her in the village of Hunsford forever. But...after all, doesn't every girl deserve a happy ending? In the world of Austen based lit, Karen Aminadra's Charlotte was a pleasant surprise. I'd picked it up as a freebie and didn't expect much from the piece, but ultimately enjoyed the author's refreshingly original take on Mr. and Mrs. Collins. Building on Austen's beloved classic, Aminadra chronicles the early days of William and Charlotte's marriage, offering readers the opportunity to indulge their love of Pride and Prejudice while affording two of its minor characters a rare chance at redemption. What I liked most about the piece is how natural it feel alongside the original. As with all spin-offs, I feel it important for writers to acknowledge the spirit of the piece on which their story is based. As such, I truly appreciated that Aminadra allowed the character attributes Austen established in the original to factor in her continuation. The said, the depth Aminadra brings to William and Charlotte is certainly worth acknowledging. The Collinses are fairly one dimensional beings in Pride and Prejudice and I was drawn to the idea that time, perspective and circumstance might allow them to grow beyond those 'first impressions' and into a mutually compassionate and loving couple. Aminadra isn't as charitable in her treatment of Lady Catherine de Burgh, but every good story needs an antagonist. The indomitable mistress of Rosings caused her share of trouble in Pride and Prejudice, but her campaign against Lizzie has nothing on her treatment of Hunsford and its residents. While not exactly endearing, the character proves an excellent foil for the Collinses and brings an exceptional sense of melodrama to the novel. I have similar feelings regarding Colonel Fitzwilliam, but again, the story needed someone to push Charlotte and really liked how his role furthered the narrative. Charlotte paused with her cup halfway to her mouth at his invitation to meet her again there in the clearing. She did not know how to react. Her mind screamed that she was a married woman and that her husband was a clergyman but her body and heart had other ideas. Author Ned Hayes was entirely unfamiliar to me when Sinful Folk arrived in my mailbox and I'll be honest, I didn't really know what to expect from the book when I cracked it open. All I know for certain is that I was pretty ticked by the time I finished chapter eight. Now before you jump down my throat, realize context is everything. I began reading Sinful Folk in August when I'd landed an excerpt of the novel in nationwide contest. An excerpt that only included chapters one through eight. Do you see what I'm getting at? If not, allow me to spell it out for you. I was hooked on this piece from page one and wasn't exactly thrilled at only having part of the novel at my immediate disposal. For two months the story hovered on the edge of my imagination, but thankfully, Sinful Folk turned out to be worth waiting for. I actually reread the opening chapters and finished the entire novel in two days, but that's neither here nor there. What matters is that the delay and anticipation didn't outweigh my ultimate admiration for Hayes narrative. First and foremost, I liked the tone of the piece. It's dark, heavy and desperate. Everything I'd imagine life in the fourteenth century to be. A lot of authors have a tendency to romanticize the era and I really appreciated the edginess of Hayes' prose especially when you consider the material he covers over the course of the story. There's a lot more in these pages than the jacket suggests - suspicion, anti-semitism, revenge, etc. - and here again, I think the layers and subplots bring a very authentic level of drama to the story. Mear is also worth noting. Her situation and lifestyle allow her to be a somewhat androgynous narrator. At times she feels masculine, at others feminine and I thought it really interesting to see that voice develop as she came into her own. It's not unusual to see a character evolve, but it isn't every day that an author is so creative in illustrating that transition. Ask Historical Fiction Virtual Book Tour coordinator Amy Bruno, acclaimed author Anna Belfrage or B.R.A.G. host Stephanie Moore Hopkins and they'll tell you my name is synonymous with one thing: coffee. I wont waste time denying it, the ambrosial beverage is my life blood, the fuel that keeps me writing reviews at all hours of the night. 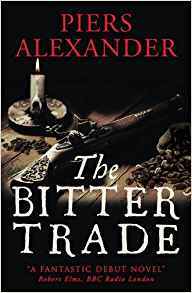 It's no exaggeration, I can rarely be found without a steaming hot cup at my side so when I heard author Piers Alexander had incorporated the robust bean and the coffeehouses of seventeenth century London into the plot of The Bitter Trade, let's just say I sat up and took notice. I've picked up novels on less, but few have impressed me as much as Alexander's debut. Richly atmospheric, the narrative plunges readers into the cutthroat world of England's capital, immersing them in a deliciously dark climate of suspicion and intrigue. Calumny Spinks, the unfortunately named son of an ill-favored union, proves a captivating and charismatic protagonist. Young though he is, the resourceful seventeen year old develops a bold, ambitious and passionate persona over the course of the narrative. A cheeky, foul-mouthed rogue with a propensity for trouble, the boy is memorable for all the right reasons and he isn't the only one. Across the board, Alexander composes a host of engaging and thought-provoking characters, individuals who illustrate what it meant to be outsiders, subject to English law but beyond its protection. The explicitness of Alexander's language might offend more sensitive readers, but personally, I liked his wickedly sharp and biting prose. Fast-paced and quick-witted, one can't help being swept into Cal's world and the conspiratorial schemes of which he finds himself a part. There were several instances where I felt Alexander might have done more with the story, but by and large I've no significant complaints over the time I spent with his work. Food for thought, The Bitter Trade is set against the Glorious Revolution, a period that is not well-known this side of the Atlantic and I while I certainly appreciated the historic scope of the novel, I'm not above suggesting readers familiarize themselves with the Huguenots before delving into this debut. It is not a requirement by any means, but a basic understanding of events might prove beneficial, especially to those who've never studied the overthrow of James II. “Ale makes men foolish,” snapped Peter, “but coffee makes them dangerous. Do not think on it. Where merchants gather, there is knavery in the air." Sir Renaud de Pierrepont, the Norman knight known as the Red Wolf for the beast he slayed with his bare hands, hoped to gain lands with his sword. A year after the Conquest, King William rewards his favored knight with Talisand, the lands of an English thegn slain at Hastings, and orders him to wed the heiress that goes with them, Lady Serena. Serena wants nothing to do with the fierce warrior to whom she has been unwillingly given, the knight who may have killed her father. When she learns the Red Wolf is coming to claim her, she dyes her flaxen hair brown and flees, disguised as a servant, determined to one day regain her lands. But her escape goes awry and she is brought back to live among her people, though not unnoticed by the new Norman lord. Deprived of his promised bride, the Red Wolf turns his attention to the comely servant girl hoping to woo her to his bed. But the wench resists, claiming she hates all Normans. As the passion between them rises, Serena wonders, can she deny the Norman her body? Or her heart? Delving into eleventh century fiction always feels like coming home. It's pretty much where I started my love affair with period based literature and I don't think I've ever really gotten over it. Heavy romance isn't my usual stomping ground, but the premise of Regan Walker's The Red Wolf's Prize, with its reference to the Norman Conquest, piqued my interest so I figured it worth a shot. Generally speaking think this a fine piece. It's a great example of the genre and I liked how Walker used the tension between the English and the Normans as a foundation for the tension between Renaud and Serena. I also enjoyed the subplots surrounding supporting characters Cassie and Rhodhi. Ideally, I'd have liked to see more emphasis on the politics of the day and a more complex story overall, but that's just me. All told, The Red Wolf's Prize is a lighter historical, perfect for those who appreciate heavy romantic story lines and heated passion. With sudden clarity, he realized he’d been played the fool. Rage filled him as he slowly rose. The lady had deceived him, living beneath his nose disguised as a servant, determined to thwart his claim to her. Well, her deception was at an end.